The hygienic measurement and control of the temperature is one of the most important factors in the beverage industry. B+B offer suitable products which meets the expectations of the beverage industry. One special product is e.g. the penetration probe with centric measuring tip. Its protection tube is made of stainless steel and due to its special construction the robust and steamproof penetration probe is ideal for control of cooking and baking processes in all domains of the food and beverage industry. The ergonomic handle made of PEEK as well as the Teflon© cable are easy to clean and therefore very hygienic and acid resistant. The probes are distinguished by a high mechanical robustness. 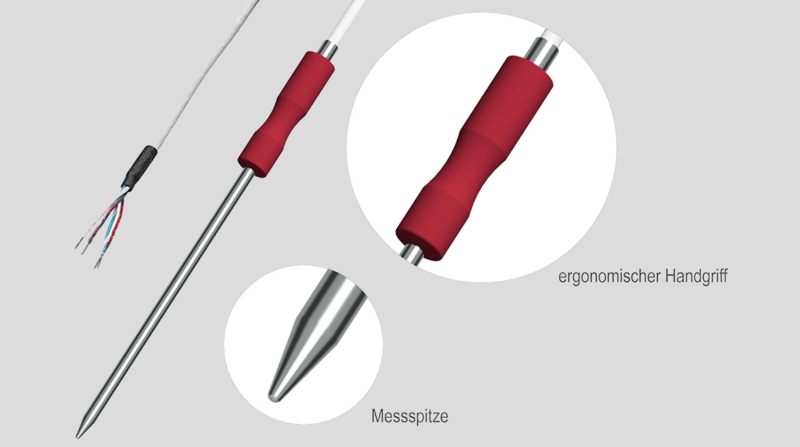 The penetration probe is available with thermocouples type K, with Pt1000 or Pt100 sensors. Please ask for further designs, accessories as well as for further products which are suitable for the food industry. Further interest? Please do not hesitate to contact us here!